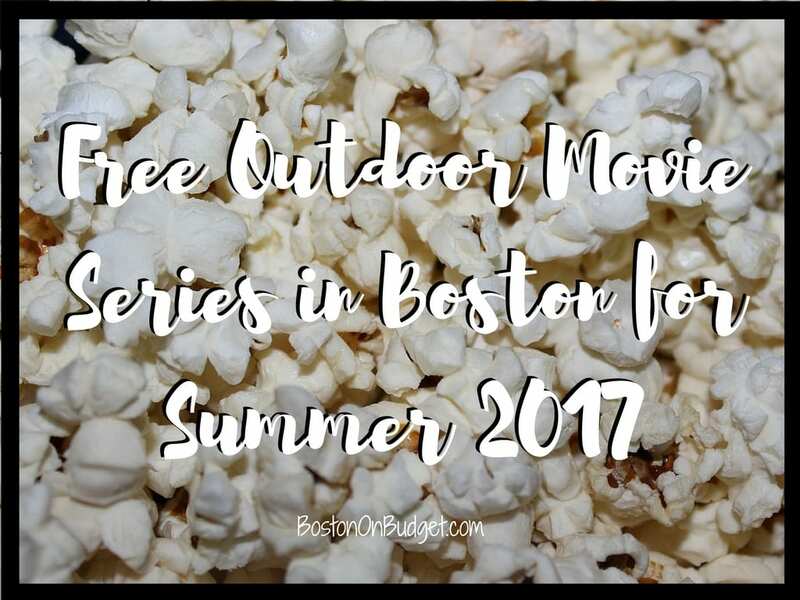 There are so many free outdoor movie screenings this summer in and around Boston to take advantage of! This is a great way to catch a great movie outside for free! Don’t forget to bring a lawn chair or blanket for some extra comfort! 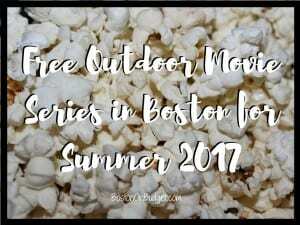 Boston Harbor Hotel has a free movies series every Friday night from June 9, 2017 to September 8, 2017 this summer outside starting at dusk. June 16: No Movie – Live Music! To view the complete schedule or for more information, please head here. WBZ NewsRadio 1030 and the Department of Conservation and Recreation host this annual outdoor movie series. Free Friday Flicks are Fridays this summer at the DCR Hatch Shell starting June 23, 2017 to August 25, 2017. Movies start at dusk but the fun kicks off at 6PM. For more information about Free Friday Flicks at the Hatch Shell, please head here. Magic 106.7 Family Film Festival takes place every Saturday night from July 1, 2017 to August 26, 2017 at the Prudential Center’s South Garden. Free outdoor movies start at dusk, but entertainment, children activities, and more start at 6PM. The rain date for all films are the following Tuesday if needed. For more information about the free Family Film Festival, please head here. Enjoy a free movie under the stars at Sylvester Baxter Riverfront Park in Somerville on Saturdays from July 8, 2017 to August 26, 2017 starting at dusk. For more information about free movie nights at Assembly Row in Somerville, please head here. Enjoy a free movie night on the lawn at Christopher Columbus Park every Sunday night from July 16, 2017 to August 27, 2017. The free outdoor event occurs from 6:30-9:30PM with the movie starting at dusk. For more information about Sunday Night Movie night, please head here. Mayor Walsh and the Boston Parks and Recreation Department and Northeastern University are bringing free movies to Boston neighborhoods on select dates this August. All movies start at dusk. For more information about Mayor Walsh’s free movie nights, please head here. Celebrate Asians and Asian Americans in film by watching classic kung fu films and other Asian films this summer at the Gate in Chinatown. This free film festival is August 25-27, 2017 at the gate in Chinatown. Film schedule is TBD. For more up-to-date information about free Films by the Gate, please head here. Head to Boston Common near Frog Pond in September for two free movie nights on Fridays at dusk. For more information about Classics on the Common, please head here. Narragansett presents a free movie screening of Jaws on The Lawn on D from 8:30PM to 10PM with activities starting at 5PM. For more information about Jaws on D, please head here. *NOTE: I noticed that Narragansett is promoting the movie for June 24th but in the Lawn on D calendar it says Friday, June 30, 2017 and other publications, so I’m not sure if the movie got moved to next week or not, so use caution with this one before you head out. Free Theatre Thursdays with a free outdoor movie screening on the beach at dusk (with activities from 6-8PM) at either Kelly’s Roast Beef or William G. Reinstein Bandstand in Revere. All Thursday night movies will have a rain date of Friday night. There are also two free Saturday Date Night movies that start at dusk as well. For more information about free movie nights at Revere Beach on Thursday nights, please head here and head here for more information about Saturday Date Night movies. Wakefield Community Access TV is sponsoring free movies by the Lake this summer in Wakefield, MA. Free outdoor movies will take place at Lake Quannapowitt by the Bandstand at nightfall. For more information about Free Movies by the Lake in Wakefield, please head here. Free outdoor family movies at French’s Common (across from Braintree Town Hall) in Braintree, MA at 8PM on select dates this summer. For more information about Braintree’s Free Family Movie Nights, please head here. Free outdoor movies at NRG Plaza (right outside Patriots ProShop) at Patriot Place in Foxboro, MA on select dates this summer sponsored by Menchie’s Frozen Yogurt. Free summer flicks start at dusk but pre-entertainment begins at 6PM. For more information about Free Sumer Flicks at Patriot Place, please head here. Please leave a comment below if there are any more great and free movie series happening this summer in Boston or if there’s any errors mentioned above. Please do your due-diligence to ensure that all information provided above is correct before you head out to a free outdoor movie showing, especially if there’s bad weather! What is your favorite movie or outdoor movie series in Boston and beyond?